Build this pole-barn for inexpensive storage for your tractors hay or feed. 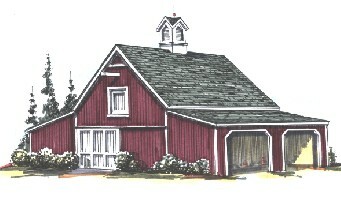 The 20'x24' center barn has two 12'x24' lean-to shelters for additional storage space. There are pull-down stairs to and an outside hatch to a high-and-dry Loft. Blueprints include a variety of easy-to-build sheds and shelters that you can add across the back for even more space. Enclosed Floor Area: 480 Sq. Ft., Shelter Area: 576 Sq. Ft., Loft Area: 420 Sq. Ft., Ridge Height: 20'-4"